In a journey across four continents, acclaimed science writer Steve Olson traces the origins of modern humans and the migrations of our ancestors throughout the world over the past 150,000 years. Like Jared Diamond’s Guns, Germs and Steel, Mapping Human History is a groundbreaking synthesis of science and history. Drawing on a wide range of sources, including the latest genetic research, linguistic evidence, and archaeological findings, Olson reveals the surprising unity among modern humans and “demonstrates just how naive some of our ideas about our human ancestry have been” (Discover).Olson offers a genealogy of all humanity, explaining, for instance, why everyone can claim Julius Caesar and Confucius as forebears. Olson also provides startling new perspectives on the invention of agriculture, the peopling of the Americas, the origins of language, the history of the Jews, and more. An engaging and lucid account, Mapping Human History will forever change how we think about ourselves and our relations with others. Mapping Human History was a National Book Awards finalist in 2002 and won the Science-in-Society Award from the National Association of Science Writers. 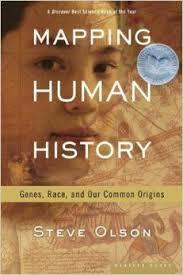 Q) How can we learn about history by studying our genes? A) One of the most remarkable scientific discoveries of the past two decades has been the realization that our DNA contains vast quantities of historical information. Essentially, each of us has a unique sequence of the chemicals that make up our DNA — even identical twins have a few differences in their genetic codes caused by random mutations during development. We all got these DNA sequences from our biological mothers and fathers, who got their DNA from our biological grandparents, and so on back through time. DNA therefore serves as a link between generations, which means that it contains a record of the human matings and migrations that produced everyone on earth today. By studying how DNA differs from person to person, geneticists have been able to identify where and when modern humans evolved, how our ancestors spread across the planet, and how the groups we know today as “races” and “ethnic groups” originated. Q) Who are the ancestors of today’s people? A) The most surprising result of genetic research is that everyone now alive is descended from an original group of anatomically modern humans. (Among them was an individual scientists call “mitochondrial Eve,” from whom everyone on the earth today got his or her mitochondrial DNA — a set of DNA separate from chromosomal DNA and inherited solely through our mothers.) This group of anatomically modern humans may have numbered just a few thousand people altogether, who lived in eastern Africa about 7,500 generations ago. That may seem like a long time ago, but in evolutionary terms it’s the blink of an eye. Human groups have not been separated from each other long enough to develop anything more than superficial differences. And because groups of modern humans have continued to mix throughout history, human populations have always remained genetically connected. Q) What is the significance of “mitochondrial Eve”? A) As I mentioned, mitochondrial Eve was one of the common ancestors of all living humans. Geneticists estimate that she lived about 150,000 years ago in eastern Africa. In other words, she was quite likely one of the people in the small group of modern humans who gave rise to the people alive today. But mitochondrial Eve was not the only woman alive at that time. Nor is she the only common ancestor of all living humans. On the contrary, the most recent common ancestor of everyone alive today probably lived just a few thousand years ago. Q) Why are the people of southern Africa who are often called Bushmen important to the genetic history of humanity? A) After modern humans appeared in eastern Africa, they expanded within Africa before spreading into the rest of the world. By about 100,000 years ago, modern humans were living near the Cape of Good Hope in southern Africa. The Bushmen may well be the descendants of this first population of modern humans to spread out of eastern Africa. For example, their mitochondrial DNA contains mutations that date back almost to the time of mitochondrial Eve. If any group has a claim to being most closely related to our early modern ancestors, it is the Bushmen. Yet these people are as biologically modern as any other group of humans, with a sophisticated language and complex social structure. Q) What happened to the Neandertals? A) As modern humans began to migrate out of Africa, they encountered populations of archaic humans who had been living in Europe and Asia for hundreds of thousands of years. The Neandertals were the archaic humans of Europe. They lived there until about 30,000 years ago; we have not found their fossilized bones from periods later than that. It has become clear over the past couple of decades that the Neandertals were replaced in Europe by modern humans coming out of Africa. The question is whether modern humans interbred with the Neandertals, in which case DNA sequences that were once in Neandertals would still be in human populations today. Geneticists have looked hard for such sequences, but they have not yet found clear evidence for interbreeding. If it did occur, it must have been infrequent, according to the genetic evidence. Q) How does genetic research being done in China figure in the story of early human migrations? A) The earliest clear evidence for the permanent movement of modern humans outside of Africa comes not from Europe or even from the Middle East. It comes instead from northern Australia. Sometime after 100,000 years ago, modern humans left Africa — probably crossing the Red Sea from the Horn — and began making their way along the shoreline of southern Asia. By about 60,000 years ago — the dating is still uncertain — modern humans had sailed from the tip of southeastern Asia to Australia. From there, they began to make their way north into eastern Asia, again with no evidence for interbreeding with the archaic humans already present in Asia. Once established in eastern Asia, modern humans began to meet and mix with their counterparts who had come from Africa into western Asia. All of these movements — and many more — can be traced in the genes of the people living in Asia today. I spent several days in Shanghai with a Chinese geneticist who has studied the Y chromosomes of more than 10,000 Chinese men to trace the movement of modern humans out of Africa and into first southeastern and then eastern Asia. Q) How did groups of people develop different physical appearances? A) As modern humans moved out of Africa, they found themselves living in different environments from those their ancestors inhabited. In both Europe and eastern Asia, for example, modern humans migrated into areas that get less sunlight than eastern Africa does. People with dark skin have an elevated risk for rickets in northern climates, because our bodies manufacture vitamin D when our skin is exposed to sunlight. People with mutations that gave them lighter skin would therefore be at a selective advantage in northern locations, and these mutations would be expected to spread among these populations. So modern Europeans and Asians are essentially the descendants of darker populations that moved north. At the same time, other factors can influence physical appearances. One of the most powerful is the preference within human groups for particular appearances. People have a tendency to pick mates on the basis of attractiveness, and these preferences can vary greatly from culture to culture. Say, for example, that a small group of modern humans expanding north from southeastern Asia developed a cultural preference for an extra fold of skin above the eyes. People would choose their mates based in part on this feature, and the DNA causing it would become more common. As a small group grew in size, these whimsical human preferences would become frozen in place. Q) Why do scientists say that human races don’t exist when people walking down a street seem so obviously to fall into racial categories? A) When we talk about a person belonging to a “race,” we mean that he or she can be placed into a discrete category defined by biology. But when you try to define those categories biologically, it cannot be done. Everyone has a unique biological history, but those histories overlap to such an extent that it is misleading to divide humans into biological categories. For instance, many people who think of themselves as “white” have recent African ancestors, just as virtually all African Americans have recent European ancestors. In fact, some people who call themselves African American have more European ancestors that some people who consider themselves European Americans do. And no matter who our recent ancestors were, the ultimate ancestors of everyone on earth are the same small group of modern humans who evolved in eastern Africa 150,000 years ago. Our history is too complex to capture in a simple word like “race.” The sooner the word is abandoned, the better. Q) If groups can differ in physical appearance, why can’t they also have inborn differences of temperament or intelligence? A) Humans have different physical appearances because they expanded throughout the world into regions with very different environments. But all human groups brought with them the mental attributes of the group from which they originated, the early modern humans of Africa. Arguments that different groups were subject to selective pressures that produced different mental attributes fail for two reasons. First, no mechanism has been identified that could sort complex attributes within such a genetically homogenous and interconnected species. And second, the development of the brain involves thousands of genes and is critically dependent on the experiences we have in the womb and growing up. It will never be possible to show that the distinctive behaviors of a group have a biological origin, because the complexity of the gene-environment interaction will always dwarf any genetic difference between groups. Q) Why are some groups overrepresented in particular sports, as African Americans are in basketball? A) Given what we now know about the genetic history of humanity, you would expect all human groups to be represented more or less equally in sports — and that’s exactly what you find, so long as you look at sports as a whole. Some groups are overrepresented in some sports, but they are exactly the sports you would expect if cultural forces were the principal cause of athletic success. African Americans are overrepresented in city sports like basketball and European Americans in suburban sports like swimming and tennis. As the social barriers to participation in sports start to change, so do these stereotypes, as represented by the Williams sisters in tennis and all of the eastern European players coming into the NBA. Some human groups clearly differ in some physical characteristics — some are taller than others, for example, and this might produce an advantage in particular sports. But even these stereotypes can be misleading. When I was in Shanghai doing research for this book, I stayed next to a high school where basketball was obviously the most popular sport on the playground, and I strongly suspect we’ll soon begin to see more NBA-quality players coming from China. Q) Why do some groups have higher incidences of particular diseases? A) As with athletics, most of these differences are rooted in our experiences rather than our genes. Japanese men living in Japan rarely get prostate cancer, but their rates rise if they move to the United States. Though many African Americans have high blood pressure, the people of rural West Africa have the lowest blood pressure of any group in the world. That said, the same genetic factors that have influenced physical appearances come into play in considering disease. Different groups have lived in different environments and so have developed resistances to the diseases endemic in those areas — malaria being the most familiar example. Also, particular mutations that contribute to our susceptibility to disease appear first in individuals and then spread to the descendants of those individuals. But the recentness of our ancestry and the tendency of groups to mix over time inevitably minimize genetic differences in disease susceptibility. Q) How long will “races” and “ethnic groups” continue to exist? A) In some parts of the world — like Hawaii, which is the setting for the last chapter of my book — intermarriage among groups is so common that many people can no longer be sorted into categories based on physical appearances. But in many parts of the world, people have few options other than marrying someone of their own “race” or “ethnic group.” For that reason, distinct group appearances will continue to exist in many parts of the world for hundreds of years. But as intermarriage accelerates — and as people gain a greater understanding of our genetic relatedness — the tendency to say that a person must have particular attributes because of the way he or she looks will inevitably decline. Q) What is it that interests you about this subject? A) The research that went into Mapping Human History is the most important I’ve undertaken in my career as a writer on science. During the 1990s I worked on several writing projects that involved the use of genetic information to explore the evolutionary history of nonhuman organisms. Gradually I realized that this same sort of analysis could be applied not only to human evolution but to human history. I began talking with the scattered researchers who were working on genetics and history, and I gathered their books and articles. Much of the genetic data have become available in just the past few years, so this is really the first time that the genetics, archaeology, and linguistics can be combined to create a single, coherent narrative. Q) How has writing this book changed your view of the world? A) Like many people, I used to divide humans into groups that I thought were fairly distinct, both as historical and as biological entities. Having written this book, I now realize just how closely related people really are. We sort people into categories and then try to justify those distinctions through biology. But the distinctions are in our heads, not in our genes.